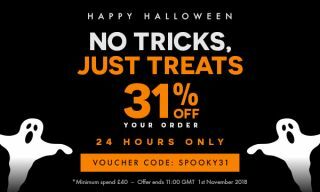 Spend at least £40/$40 and use the code SPOOKY31 to save almost a third on your purchase. Until 11AM UK time tomorrow, you can save 31% on any $40/£40/€40 order on My Favourite Magazines—including subscriptions to PC Gamer. For UK readers, it's a great opportunity to pick up a year's subscription for 31% off. Just use the code SPOOKY31 at checkout. For US readers, perhaps you'll want to combine your PC Gamer subscription with a Maximum PC or Retro Gamer subscription to pass the $40 mark. If you want more detailed hardware coverage sent to your door or great features about retro games—some of which we've published on this site—it's a great fit. You don't have long to take advantage of this Halloween-themed deal, what with the whole Halloween thing being over by tomorrow morning, so time is short. You can have the best games magazines in the world sent to your door.